Murjan Splash Park is a water based attraction located within Khalifa Park. Photo credits to Abu Dhabi Municipality. At the center of Murjan is a water play structure with slides, tipping buckets, umbrellas, water guns, tunnels, etc. This is the area where most of the action takes place. The water is very shallow and even a baby won't be afraid to dip into the refreshing waters of Murjan and play. Near the water play structure is like a pop jet fountain where the water sprouts from the ground, which my little Xanti loved. Kids also have the chance to play captain of the ship in a day, as Murjan has an area where they can drive the ship using miniature helms. They also have the lazy liver where the kids can float on float tubes and let the water current drive them into the course of the river. Kids can also enjoy playing in the bumper boat lagoon where they get to drive battery operated boats and bump gently with other kids just like driving a bump car. The bigger kids can try out the balloon wars where they can hit the target using water-filled balloons in a sling-shot in their opponent's base to get them wet. There is also the bucket wars where two kids can play, one on each side, and whoever fills the opponent's bucket first will have the fun of getting the opponent splashed with a bucket full of water. For the adventure seekers, there is the Lilipad Hop where kids, secured with harnesses, can jump and flip over trampolines. There is also the Surf Wrangler that simulates a rather beginner surfing experience. I say during the summer season, a visit to Murjan Splash Park is a must as it will definitely bring a smile to your little one's face. 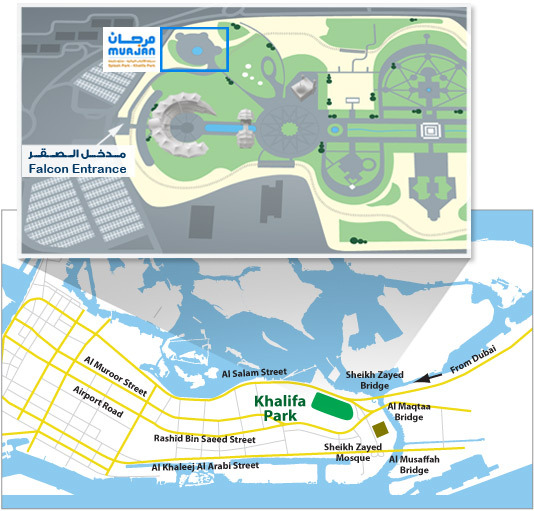 Khalifa Park near Falcon Entrance. Please note that the park closes at 6:00 pm and reopens at 7:00 pm. Those who are already inside the park should go out during this time and purchase another ticket to reenter the park. AED 40 for adults and children taller than 75 cm. Children below 75 cm can go inside for free. Yes. Swim shorts and t-shirt for both male and female. It is not allowed to bring food or water from outside. Not allowed. This has to be left in the reception area. Available at a rate of 10 AED. After spending almost half a day at Murjan, there are also other attractions in Khalifa Park such as the train, museum, etc., which you can also enjoy.